In this Oct. 10, 2018 photo, He Jiankui speaks during an interview at a laboratory in Shenzhen in southern China's Guangdong province. 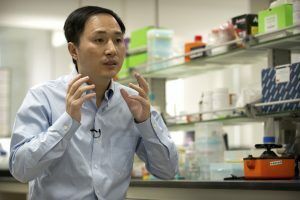 Chinese scientist He claims he helped make world's first genetically edited babies: twin girls whose DNA he said he altered. He revealed it Monday, Nov. 26, in Hong Kong to one of the organizers of an international conference on gene editing.